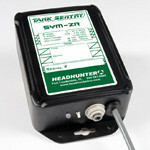 Control Panels | Tank Sentry Fluid Monitoring | Headhunter Inc. 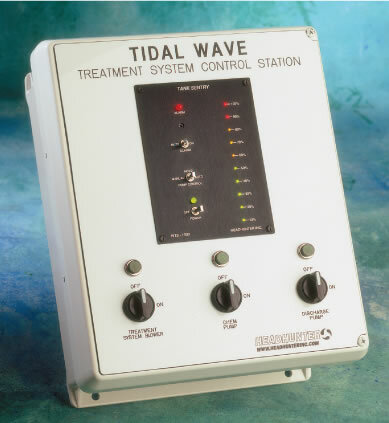 Tidal Wave electric control panels are designed to simplify the installation of our treatment system’s electrical components and other accessories that may be required. 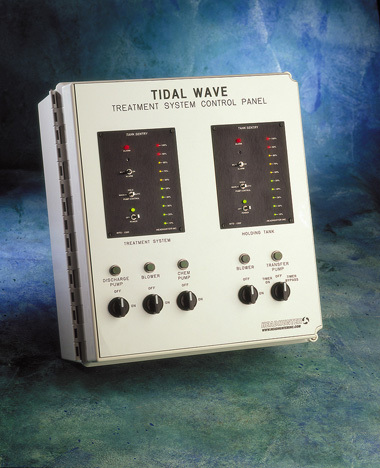 All Tidal Wave electrical control panels are built with the latest, industrial grade GE switches, contactors and motor controller. These motor controllers are listed under UL 508 as manual motor starters and comply with IEC international standards, for worldwide application. GE motor controllers provide Class 10 thermal overload protection, easy current adjustment, and a start, stop, rocker switch trip indication. All panels provide circuit protection and motor control for the blower, and chemical injection pump used on every treatment system. In addition, the panels shown below provide automated sewage transfer and discharge functions as required by the installed location of the treatment system. 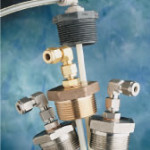 Complete circuit management for the MSD blower, MSD chemical injection pump, and effluent discharge pump. This electrical panel is used when the toilets flush directly into the Tidal Wave MSD. Includes a complete Tank Sentry WTS-1500B for monitoring the final chamber, the disinfection chamber, of the MSD and automatically activating a discharge pump. Complete circuit management provided for the holding tank blower, sewage transfer pump, MSD blower, and MSD chemical injection pump. This electrical panel is used when the toilets flush directly into an aerated holding tank, and the sewage is transferred to the Tidal Wave MSD, which is installed above the waterline. Includes a complete Tank Sentry WTS-1500B for monitoring holding tank level, interfaced with a timing relay to automate sewage transfer into the MSD. Complete circuit management for a holding tank blower, sewage transfer pump, MSD blower, MSD chemical injection pump, and effluent discharge pump. This panel is used on installations where the toilet flushes into an aerated holding tank, and the sewage is transferred into a Tidal Wave MSD that is installed below the waterline. Includes a complete Tank Sentry WTS-1500B for monitoring holding tank level, interfaced with a timing relay to automate sewage transfer into the MSD. Includes a complete Tank Sentry WTS-1500B for monitoring the final disinfection chamber of the MSD and automatically activating a discharge pump. Headhunter’s Custom Control Department has the capability to design and assemble virtually any custom control panel design imaginable. 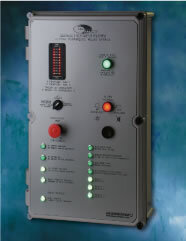 Many OEMs take advantage of our unique capability to significantly simplify their installations by combining our Tank Sentry fluid level controls with PLCs, motor controllers, and motor starters, in a wide variety of enclosures. 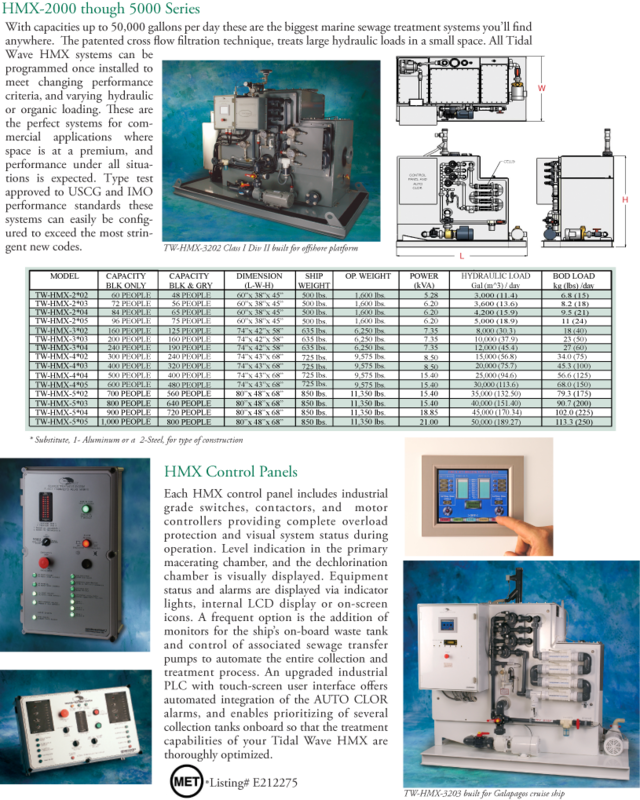 All custom control panels include detailed AutoCAD documentation of wiring and control logic. Each HMX control panel includes industrial grade switches, contactors, and motor controllers providing complete overload protection and visual system status during operation. Level indication in the primary macerating chamber, and the dechlorination chamber is visually displayed. 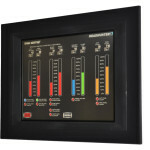 Equipment status and alarms are displayed via indicator lights, internal LCD display or on-screen icons. A frequent option is the addition of monitors for the ship’s on-board waste tank and control of associated sewage transfer pumps to automate the entire process. An upgraded industrial PLC with touch-screen user interface offers automated integration of the AUTO CLOR alarms, and enables prioritizing of several collection tanks onboard so that the treatment capabilities of your Tidal Wave HMX are thoroughly optimized.